For a brother who is so precious to you without whom you cannot imagine your life, you can do anything to bring a million dollar smile on his face. Right? So, why not pamper him and make him feel loved on Raksha Bandhan? So, just send a sterling silver rakhi for your brother from FlowerAura and make him feel special. Rakhi has always been one of the most auspicious occasions that celebrates the pious bond between a brother and a sister. The Rakhi thread being the mark of the sweet relationship that siblings share, there is no denying the fact that the day brings siblings close to each other. To make the day more interesting and meaningful, FlowerAura comes with a variety of choices of rakhis online and one of the popular favorites being the Silver Rakhi bracelet. We have a wide variety of sterling silver rakhi online that can ensure a million dollar smile on your brother's face. What Does A Silver Rakhi Symbolize? A pure silver rakhi is often associated with prestige and wealth. The lustrous sheen of silver never fails to catch the attention. Whether it is in the form of jewellery or accessory or a rakhi, silvers are something that hold the universal charm. So, on the upcoming occasion of Rakshabandhan, if you want to surprise your dear brother, buy a silver rakhi online from FlowerAura comfortably seated at your home.You can in fact order gold and silver rakhi both from FlowerAura and make your brothers feel like a king on Raksha Bandhan. A silver rakhi symbolizes royalty, charm, and elegance.They are not only auspicious but are also the Rakhis that would be cherished forever. To order silver rakhis online from FlowerAura, all you need to do is to visit our website, pick your favorite rakhi, and place your order. To choose your personal favorite rakhi for brother online, you can browse through our website for many other amazing options. 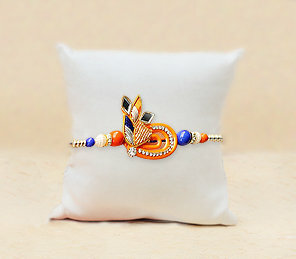 Are you looking for something very elegant, designer and yet auspicious for your brother this Rakhi? Well, then as you already know, there is nothing better than the Silver Rakhi. So, have you done your online shopping for silver rakhi yet? If not, then hurry up to order a lustrous silver rakhi for brother from FlowerAura. Rakshabandhan is one of the most celebrated and auspicious occasions that signifies the bond of a brother and sister. Every sister wants to surprise her brother with something majestic and equally unique. And the mesmerizing rakhi with sweets combo fulfils all the requirements. Silver Rakhi is not only gorgeous but equally fascinating. You might have bought many Rakhis so far, but let us be honest; Sterling silver Rakhi will look extremely stunning on your brother's wrist. Silver rakhi is generally embellished with studded silver and gold articles and zircon, also with rhinestone diamond. The enamelling casting makes it a class apart. These look royal as well as alluring and are now available with a diverse assortment only on Floweraura with free shipping. With FlowerAura, you can also send Rakhi gifts to Ranchi online if he resides in Ranchi as FlowerAura operates in the city with its impeccable services. FlowerAura makes sure that all your greetings and well wishes reach your brother on time, and to keep the warmth of the occasion intact, FlowerAura has come up with an option of same day delivery. Do you know that now you can send silver rakhis online in India? Yes, with the aid of FlowerAura's express delivery service, now you can send silver rakhi to India for your brother and make your Raksha Bandhan celebrations memorable. If your brother lives in away from you and cannot make it to home on Raksha Bandhan then, don't be upset because now you can send him a rakhi online via our same day rakhi delivery. You can choose a rakhi for your brother from our entire range of rakhi sets online and place your order at floweraura.com. To make your brother feel like a Prince, make sure to order a silver rakhi from our online gift portal. To enjoy a hassle free silver rakhi online shopping, order rakhis from FlowerAura this Raksha Bandhan because we ensure same day rakhi delivery across India. Silver rakhi has always been regarded as one of the most auspicious metals and as per the Indian mythology and scriptures, buying silver bring wealth, happiness, and prosperity. So, this Rakshabandhan, tie the silver plated thread of purity on your brother's hand. If your brother is living far away, fret not. FlowerAura operates in more than 200 cities which makes it possible for you to send your token of love with instant delivery. FlowerAura operates in most of the cities. So, you can send Rakhi to Delhi with free home delivery without much hassle. Rakhis carry an emotional significance apart from just being a remarkable occasion of sibling love. And that is why choosing the perfect Rakhi that conveys your feelings is indispensable. Therefore, the well-crafted and designed Silver Rakhis are trendy and attractive. It is unique and attractive and talks volume about your love for your brother. So, celebrate this auspicious occasion of Rakshabandhan with amazing Silver Rakhis from FlowerAura and rejoice the sibling love.